The endless plains of East Africa are the setting for the world’s greatest wildlife spectacle on earth – the million-plus wildebeest migration. 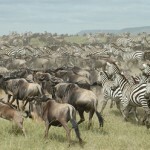 During the period January through March the seemingly unending short grass plains of the southern Serengeti, and the Ngorongoro Conservation Area, are inhabited by enormous herds of wildebeest and zebra. 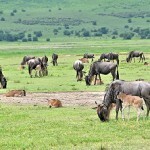 Pregnant female wildebeest are attracted to the calcium and magnesium rich grass which is good for milk production. Calving occurs late January through mid March when over 80% of the female wildebeest give birth over a period of a few weeks. An estimated 400,000 wildebeest calves are born during this period. This is a wonderful time of the year to visit this part of Africa and our safari will leave you with special memories that will last a lifetime. Come and join us – you’ll be so glad you did. Day 1 07 February, 2020 Australia – Arusha, Tanzania Based on current flight schedules (as at Jan ’19) we suggest flying with Qatar Airlines via Doha to Kilimanjaro. **We will meet in Doha and travel together from there. Flights currently depart from Adelaide, Melbourne, Sydney and Perth. We can book your flights for you and team you up with others in the group or you can use your frequent flyer points. The African Tulip is an elegant and charming Luxury Boutique Hotel located along Serengeti Road right in the heart of Arusha. A warm and friendly welcome awaits guests who want to experience the best of Tanzanian hospitality. The hotel has been designed with safari travellers, business persons, families, honeymooners, elite and leisure travelers in mind. It has amenities of convenience whilst offering a high standard of luxury. After breakfast we are ‘on safari’ as we travel to Tarangire National Park. 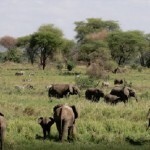 Tarangire is one of Tanzania’s largest national parks and sanctuary for an unusually large elephant population. Majestic baobab trees are an interesting feature of the park. 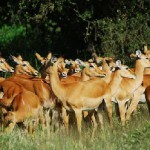 Animals concentrate along the Tarangire River, which provides the only permanent water supply in the area. 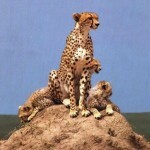 There is a great diversity of wildlife including lion, leopard, cheetah and up to six thousand elephant. 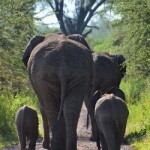 After lunch at the lodged, enjoy Enjoy your first afternoon game drive. Built on top of a high bluff with a breathtaking panorama, our lodge is superbly located in Tarangire National Park, providing one of the best views in Africa. Carving out the landscape below the lodge is the Tarangire River, a favourite watering place, which attracts impressive numbers and a variety of game. The scene unfolds before you while lounging on the outdoor terrace, allowing you to appreciate Tarangire’s diverse wildlife. 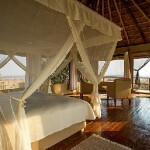 At the heart of the lodge are the impressively high thatched roofs of the lounge and dining room. 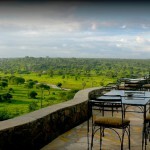 The open-sided design allows an uninterrupted view of the landscape and wildlife below, and captures the cooling breeze while you dine on delicious home cooked safari cuisine. The lounge area has oversized armchairs made from old dhow boats ~ a perfect place to relax. Those wanting something a bit more active can take a dip in the pool, a bird walk around the lodge grounds or hunt for souvenirs in the Baobab boutique. Our tents combine the authentic safari atmosphere of ‘nights under canvas’, with more modern comforts of electric light and en suite bathrooms with solar hot water. Uncrowded and relatively unknown, Tarangire National Park covers approximately 2 850km² just south of Lake Manyara in the northern region of Tanzania. Famous for its vast herds of elephants and forests of enigmatic giant baobab trees, the rugged landscape is incredibly diverse and stands out from any other on the traditional northern safari circuit. 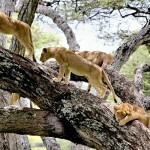 Tarangire is a park for those who want to step that much further off the beaten track to experience a truly wild area. A Tarangire National Park safari boasts large herds of elephant and buffalo, and a remarkable concentration of big cats and is one of the best National Parks in Tanzania. The African wild dog, kudu, oryx and gerenuk, rarely found in other parks in the northern circuit, can also be found here, along with arguably the best bird diversity in Africa. More than 550 species are attracted to its vibrant swamps. Discover exclusive luxury at Lake Masek Luxury Tented Camp situated in the Ngorongoro Conservation Area overlooking Lake Masek. 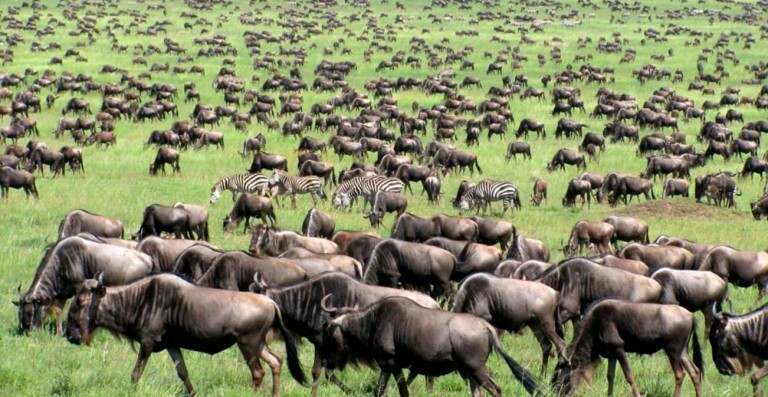 This unique location is witness to the Wildebeest Migration which takes place from December to April each year. 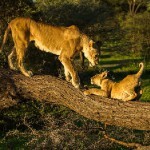 There is resident Big 5 game all year round in the area. Kubu Kubu Tented Camp is situated in the stunning central part of the Serengeti, and is strategically positioned in one of the main migration areas so that guests can enjoy this awesome natural wonder from the comfort of their tents. Perfectly situated to be within easy reach of different parts of the park and an array of areas of interest and diverse habitats and wildlife, including the famous Maasai Kopjes, Olduvai Gorge Museum, the southern plains, the Seronera valley and the Grumeti River we are guaranteed of some magnificent scenery and most likely animal sightings in abundance. 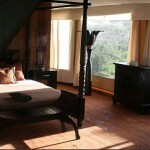 There are 25 spacious en-suite tents which offer absolute comfort, exclusivity and a genuine African bush experience. In the central restaurant guests can enjoy exceptional food and wines, and the cozy lounge area has been creatively designed to give an atmosphere of intimacy and exclusivity. There is also a swimming pool in which to relax after a long game drive. Internet access is available in the camp with Wifi in the central area. This small, intimate lodge and spa is set above a valley with glorious views making Kitela an ideal, away-from-the-crowds base from which to explore the region. 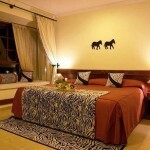 The main building serves as a hub for luxurious cottages nestled in a landscaped tropical garden. All cottages are en suite, with shower and bath. 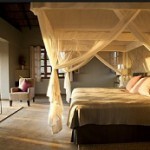 Fans cool the air, mosquito nets cover the beds and cozy fireplaces add a wonderful atmospheric touch. A stylishly decorated lodge and spa with luxuriant gardens and pool, Kitela Lodge is a tranquil haven set in picturesque surroundings. Indulge in a treatment at the African Spa – the perfect place to unwind after the rigours of your safari, or to prepare yourself for the adventure that awaits you. With 20 cottages dotted around the grounds served by a main building, spa, bar and dining area, this is an exclusive and luxurious lodge set close to the Ngorongoro Crater and its abundant wildlife. A leisurely breakfast this morning before spending the day exactly as you want to. Either exploring some of the sights of Arusha or relaxing by the hotel pool and catching up with your journal and photos. Perhaps visit Shanga, a successful social enterprise which employs people with disabilities to create unique, high-quality, handmade jewellery, glassware and home wares incorporating recycled materials. 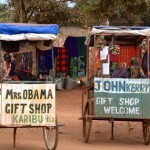 These products are sold in Tanzania and all over the world, with profits being reinvested back into developing opportunities to employ more people with disabilities. Combining an uplifting local community project with unique artistic activities and opportunities to purchase handmade gifts, Shanga has been a favourite Arusha tourist destination since its inception in 2007. Not far from Shanga is the wonderful Arusha Cultural Heritage Centre where the past and present of Tanzania’s 120-plus tribes can be viewed in a single compound. The centre boasts of various carvings, gemstones, artefacts, clothing and books. Depending on the time, we can have lunch at either Shanga or the Cultural Centre. Both have a restaurant, coffee shop etc and the food is very good. Transportation is not included today and those that want to join us, can share taxis to and from the hotel. Our safari comes to an end today with a transfer back to the airport for our overnight flight home. We would be happy to assist with your onward travel arrangements. 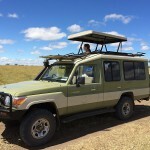 Our safari vehicles are Toyota Landcruisers with pop up roof so you can stand and view the animals. Each vehicle has 6 client window seats which recline and they are adjustable to move forward or backwards. This means if you are tall, we can push the chair back and you will have more leg room. This feature is unique to our vehicles. The vehicles also have a fridge for keeping drinks cold and power adaptors for charging cameras, including universal adaptors. Gratuities to driver/guides. The recommended is $US150 per person for the entire tour.